Apart from inquiring about learning context, potters socio-economic status, production and selling contexts, these fieldwork missions aimed to record the different ceramic “chaînes opératoires”, from clay extraction to firing, and their variants depending on morpho-metric types. The detailed understanding of techniques and methods along with collection of potteries has allowed the constitution of a unique reference data base of micro/macro-traces , which will be used to interpret in terms of manufacturing techniques and methods ceramics from central and southern Ethiopian megalithic sites, dated between 8th -15th AD. 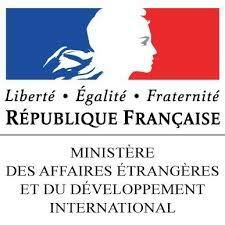 At this stage of my research, it is possible to define major technological trends shared by different cultural groups, generally located in the same region. In order to propose a geo-cultural repartition of the present-day traditions, technological boundaries had to be checked to complete the mapping and to better evaluate the superposition between technological and cultural boundaries. 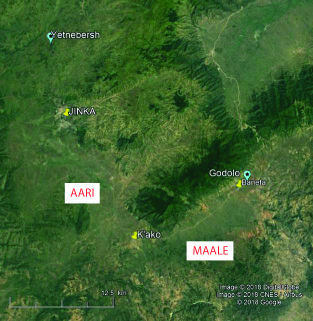 In this perspective, our objectives were on the one hand to test the technological homogeneity of the Amhara tradition between North Shoa and South Wollo areas; on the other hand to compare the ceramic tradition of the Maale people with the one of their neighbors Aari in the South Omo zone (Fig. 1). Fig. 1. 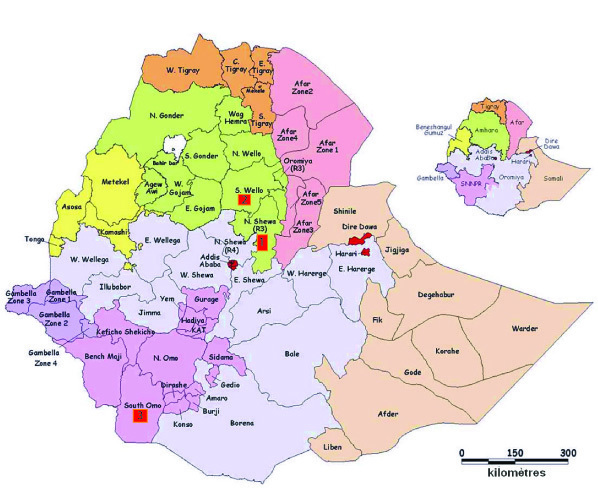 Ethiopian map with research zones in red: 1) North Shoa, 2) South Wollo, 3) South Omo. Moreover, these fieldwork missions aimed at: 1) refining the contextual and technological information previously collected; 2) carrying out experimentations; 3) testing the correlation between ethnic group and technical tradition; for this purpose, technical observations have been conducted for a middle-size jar allowing comparison between different ethnic groups and within the groups, in order to highlight either similarity in the whole geo-cultural area, or technical diversity due to borrowings; 4) recording the forming process of the biggest jars used for beer, gan, which are disappearing in many areas. These missions have been conducted with Sintayehu Gobezie that I warmly thank. They have also benefited from the help, welcoming and participation of many: in Menteq, Abba Kidane Maryam and all monastery habitants; Yamenashu and Kelem in Zego; Ndale, his sons, Itabez and Aragash in Kurit; Ebenezer, Gitcho, Astayo, Gizaïnesh, Ulo and Shalito in Godolo. The Amhara ceramic tradition is characterized by the mixing of two different clays, one red or black whose hydration is made by immersion, and the other white or grey reduced in powder and hydrated by impregnation during its incorporation to the first. The roughing out technique of the jar’s lower body starts by the drawing of a rectangular slab disposed in circle on its edge. The upper part and the bottom are thinned by drawing coils disposed in segments and placed obliquely on the internal and/or external face. Shaping is done by scraping with tools made in bamboo, calabash, wood and/or plastic. These scrapers are also used for smoothing. The lip is shaped and smoothed with a piece of leather. The characteristic shine of Amhara potteries is obtained by a specific surface treatment: burnishing with a soft stone, coating with a fatty slip, followed by shining with dried cloth. The typical black color of Amhara potteries used for service is obtained after firing, by smoking. First fieldwork in Shoa took place in the monastery of craft workers located in Menteq, 20 km far from the famous former Menelik’s capital: Ankober, several time described from the mid-19th century to recently (Isenberg & Krapf, 1843; Pankhurst, 1998). Fesses, an elder potter representing women in the monastery, guided us within the discovery of the forming techniques and repertory of 30 different pottery types, among which only half are still nowadays produced. Fesses died one month and half before our second visit. We would like to pay tribute to her in these few lines, in recognition to her skill, patience and strength that she taught to many potters (Fig. 3). With Fesses, the know-how to shape gan in the valley has disappeared, as well as the whole monastery’s pottery production because she was the one encouraging and managing this daily activity. During 2018 fieldwork, we worked in Zego village, 3km far from Menteq, with Yemenashu who was a close friend of Fesses (Fig. 3). Fig. 2. 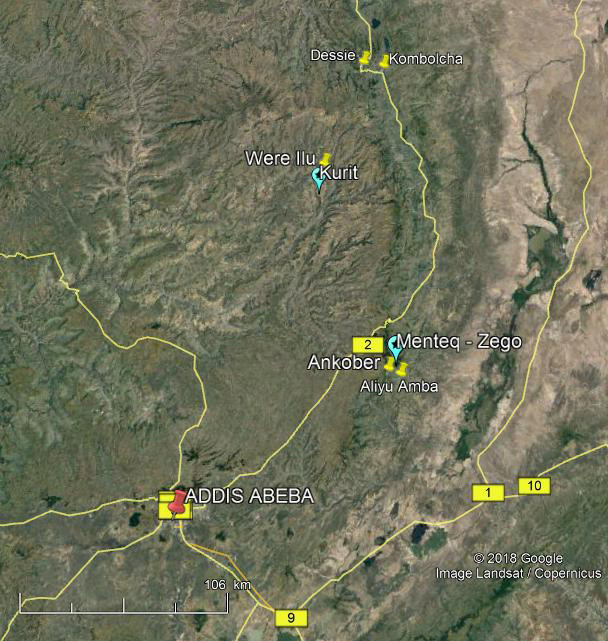 Location of mentioned places in Amhara region. Fig. 3. Portraits of Fesses, and Yemenashu smoothing a jar’s lower part. In South Wollo, we worked in the Kurit village, located south of Were Ilu, another Menelik’s capital particularly known for the production of ceramics sold until Dessie and Kombolcha markets. There potters are still producing gan (Fig. 4). 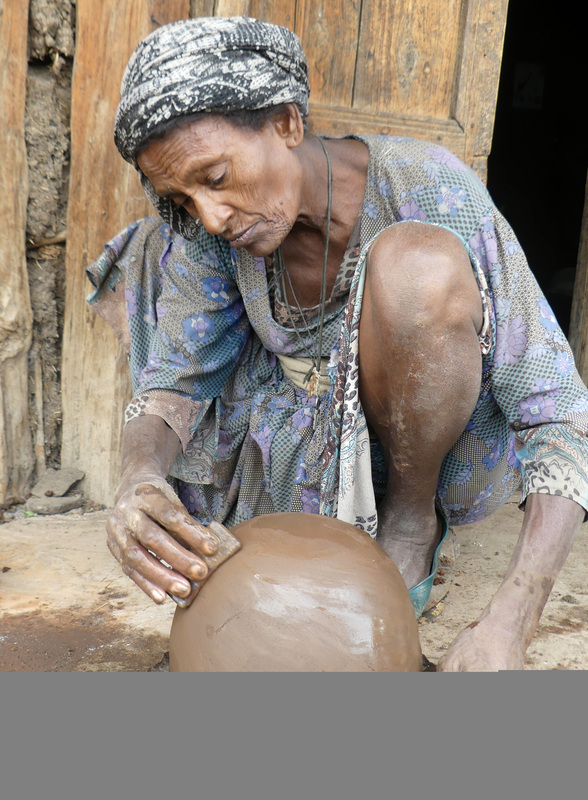 As often in Ethiopia, learning context is family, transmission is vertical and a strong parental system links the different families of potters who rarely marry with non-potters. Fig. 4. Ndale and his sons’ houses in Kurit. in the foreground, men are cleaning the firing area while women are doing the pre-firing of pots by introducing hot charcoals in jars, hence the heavy smoke inside the courtyard. 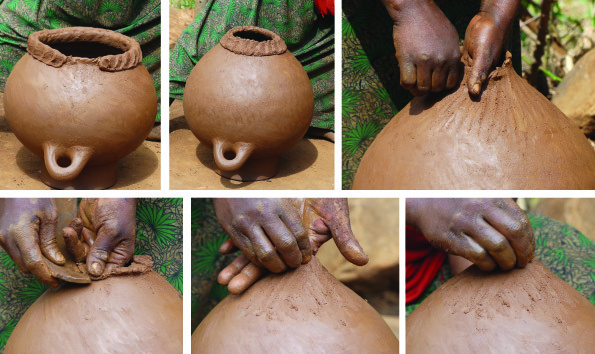 1) Regarding phase sequences, Shoa potters are shaping first the jar’s lower body and its bottom, when Wollo potters start by the lower body of the jar and its upper part. This difference of methods produce differences in potter’s positions and spinning systems. 2) Regarding stages, Shoa potters are thinning, shaping and smoothing gradually each assembled element, whereas Wollo potters thin and shape each coils but smooth the whole phase at the end. Fig. 5. 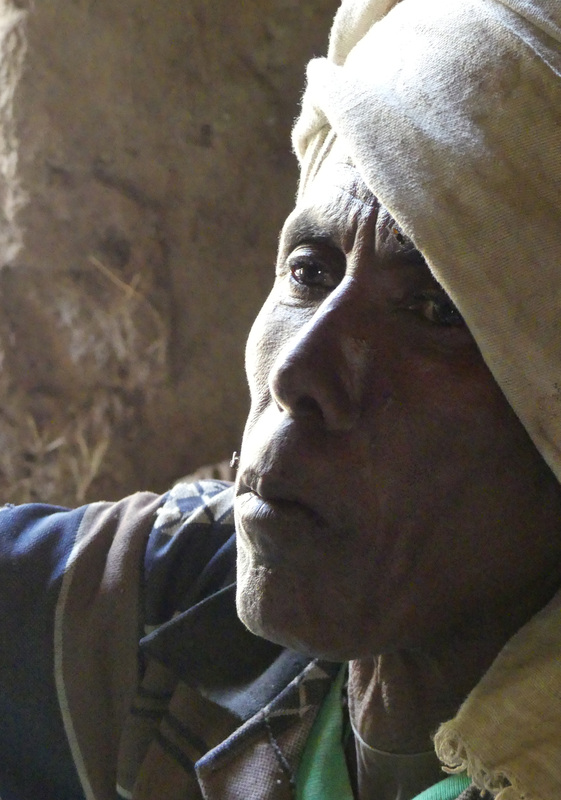 Synthetic information about clay preparation used for each of the Amhara traditions studied. 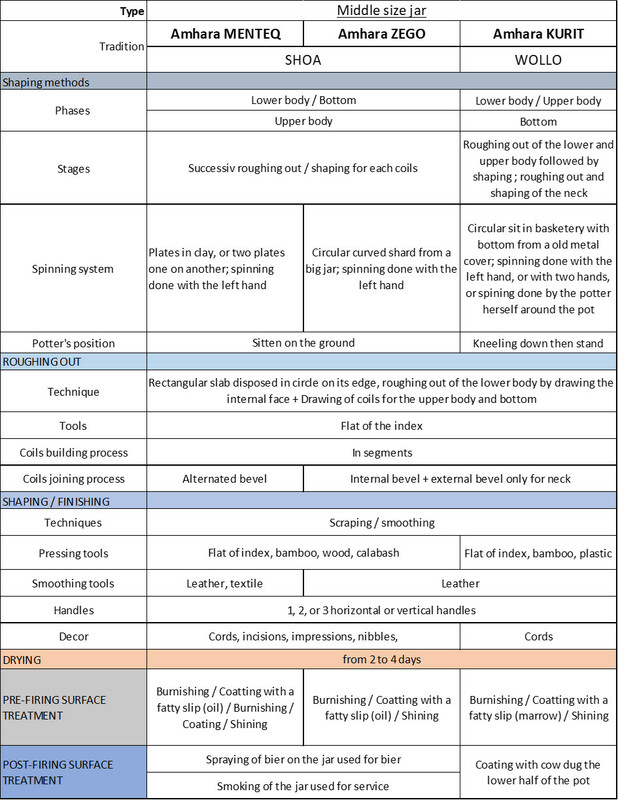 Stages of preparation are detailed for each material in one column until they become mixed. Fig. 6. Synthetic information about the “chaîne opératoire” used for the shaping of middle size jar, in each Amhara tradition studied. These differences in methods create a regional variability whom history has still to be written. From what Wollo potters said, their method assure the regularity of the form. Nevertheless, they know the Shoa method (first lower part and bottom, then upper part), as they use it for the production of coffee pot and biggest jar because it allow them to smooth the internal part of the bottom before having no more access to it. Within the Shoa tradition where techniques and methods are identical, some idiosyncratic variability have been observed in joining procedures and surface treatment stages. They appear to be the fruit of Fesses’ (or her tutors’) skill who have their heart set on producing great quality of ceramics. Indeed, the alternated bevel, rather than internal bevel only, assures a greater profile’s regularity; several burnishing and coating operations before shining gives a silkier and shinier surface. We recorded the ceramic tradition of the Maale potters in the Godolo village, in the surrounding of Aari territory where we previously worked in Yetnebersh village. Godolo is not far from K’ako which is one of the biggest markets of the area where Benna people come to buy, among other things, potteries from Aari and Maale (Fig. 7). Potters are called Mani and form a socio-cultural endogamous group relatively isolated from the rest of the agro-pastoral population. Among the 180 objects composing the material culture of Maale, well described by Sophia Thubauville, twelve are made in ceramic (2005). However, we noticed the disappearance of boko (plates) and the appearance of mendeja (brasero). Fig. 7. Location of mentioned places in South Omo zone. The initial lump is a flat hollow cylinder, whose rim is squashed by percussion with the hand palm until obtaining a conical roughout that the potter disposes tip on the ground. Then she pushes the whole internal face, to get a large cylindrical roughout with flat bottom. The roughing out of the upper body is done by drawing the internal face with the flat of the forefinger, then by pulling the external face first with the extremity of fingers, second with the flat of one finger. Neck is formed by adding a coil and joining it to the body by spreading clay from the body upwards, then by drawing it on the internal and external part. The rim is shaped by pinching, then smoothed with a piece of plastic bag with a continuous gesture. The shaping of the upper body is done by scraping the external face with first a bone scraper, then with a calabash scraper; the left hand acts as a support on the internal face. After a short drying time, the internal face is shaped and smoothed using the shell of birbira seeds as scraper. Finally external face and rim are smoothed again as previously described. The internal smoothing is repeated after a drying time of 30 minutes, and the base is covered with a cloth to keep it wet during the drying time. After two hours, the potter decorates the pot and places handles on leather hard clay. The lower body is shaped half a day later. The jar is turned down and the flat bottom is taken out. The roughing out of the lower part starts in drawing the edge left over clay, followed by scraping with the shell scraper. Then a coil is added and drawn. The scraping of the external face is done with the bone tool. For the shaping of the base, two more coils are added. Each coil is successively drawn, shaped and smoothed until closing the bottom. 3.2. Which contribution and conclusion? This field survey has shown first that Maale ceramic tradition is clearly different from the one of the Aari potters. 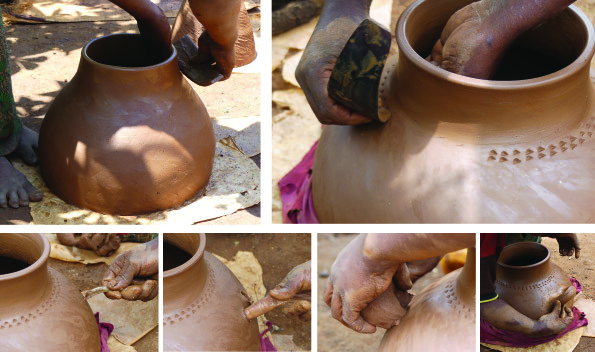 If they start with a similar lump of clay and if the forming technique is the coiling by drawing, however there are strong variations in methods: in the Aari tradition, the thinning of the roughing out is done with horizontal gestures and coils are added for the neck by smearing little segments. 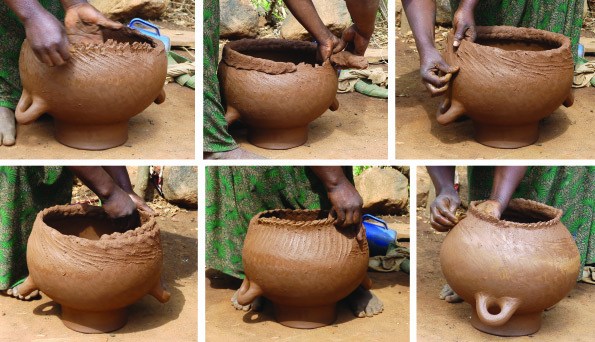 In this regard, the Maale method is closer to the one used by Konso, Gofa or Wolloyta potters. Second, based on this first evidence, we have revealed an important and interesting change in the technical tradition. 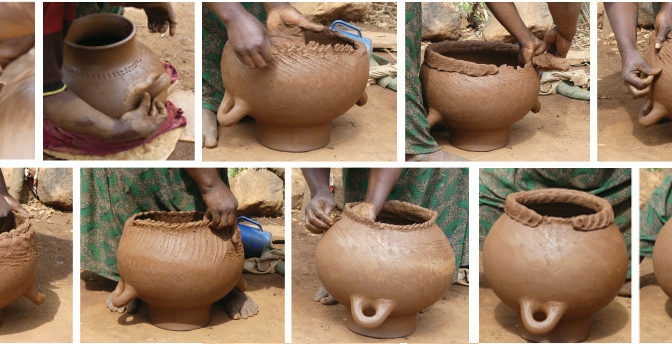 In Maale, the same described method is used for shaping the little size jars, while Wolloyta potters are using another technique for the bottom of the little jars: forming the lower part by pressing internally the left over clay stayed in bottom, then shaving the external face. 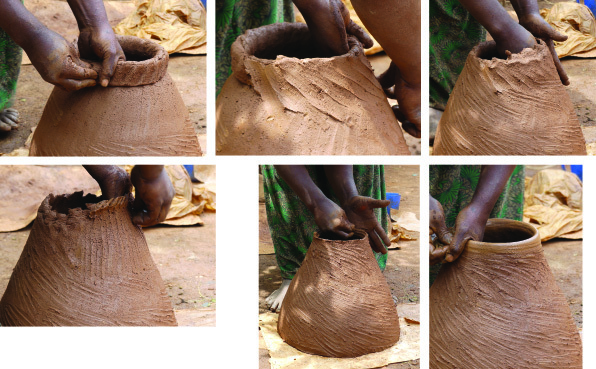 When we described this technique to Maale potters, they indeed recognized that they learnt and were using this technique for the lower part of the little jars. The technique of closing the bottom by drawing coils has been extended to all kind of jars these last years because potters found it finally easier and assuring a better regularity of the profile. This technical variation is not the consequence of a socio-cultural renewing or innovation diffusion, it is inherent to the particular evolution of a technical system along with its skill development. This tradition change shows the difficulty to build technique histories and the necessity to be cautious in interpreting the evolution of ancient technological traditions. Isenberg Charles William & Krapf Johann Ludwig, Journals of the Rev. Messera Isenberg and Krapf, London, 1943. Pankhurst Richard, A visit to the craftsmen’s gädam, or monastery, of Mänteq, near Ankobär, Shäwa, Rivista trimestrale di studi e documentazione dell’Istituto italiano per l’Africa e l’Oriente, Anno 53, No. 4, Dicembre 1998, pp. 587-596. Thubauville Sophia, Maale Material Objects in their social and ritual context, M.A. Thesis in Social Anthropology, University of Mainz, 2005.